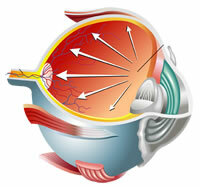 Glaucoma is a very common but treatable eye disease. It's one of the leading causes of blindness among older adults in the Chicago area and worldwide. When you need a skilled eye doctor in the Chicago area for glaucoma treatment, please contact Foulkes Vision in Lombard, Illinois, to schedule your consultation with one of our ophthalmologists: 630-724-1400. Glaucoma has no known cause. It is often referred to as "the silent thief of sight" because its symptoms can be virtually undetectable. Since your likelihood of developing glaucoma increases with age, we recommend that Foulkes Vision patients undergo glaucoma screening annually after age 40. The most recognizable sign of glaucoma is a visual clouding of the eye's natural lens. While the symptoms can be subtle, there are additional circumstances that can make glaucoma even more likely among particular Chicago ophthalmology patients. There are two dominant forms of this disease. Primary Open-Angle Glaucoma — The eye's natural drainage system is askew, which causes fluid buildup behind the lends, an gradual pressure increase inside your eye. This condition can develop without pain, which means some serious glaucoma cases result in the patient losing a significant portion of their vision long before a formal glaucoma diagnosis. Closed Angle Glaucoma — This occurs when the iris swells and ultimately prevent proper fluid drainage. Eye Drops. Our Chicago ophthalmologist by may choose to prescribe a combination of glaucoma medications. The goal of a pharmaceutical approach to treatment would be to reduce elevated pressure and prevent optic nerve damage. Selective Laser Trabeculoplasty (SLT). This laser-assisted procedure directly that treats the drain to help boost outflow. It is not painful, can be performed more than once, and provides a more proactive approach to glaucoma treatment than medication. Trabeculectomy (Filtration Surgery). During this procedure, the surgeon devises a fresh drainage channel within the eye. Laser Peripheral Iridotomy (LPI). This procedure is intended for closed-angle glaucoma. It involves creating a small hole in the iris that allows for better drainage, diminishes fluid buildup in the eye, and deters ocular nerve damage. When you need a skilled eye doctor in the Chicago area for glaucoma treatment, please contact Foulkes Vision in Lombard to schedule your consultation with our ophthalmologist: 630-724-1400.